The Habitat, inside the Wild Area. From Superman's Pal, Jimmy Olsen #133 (1970); art by Jack Kirby and Vince Colletta. Jude and the Hairies. From Superman's Pal, Jimmy Olsen #134 (1970); art by Jack Kirby and Vince Colletta. Darkseid's inauspicious debut. From Superman's Pal, Jimmy Olsen #134 (1970); art by Jack Kirby and Vince Colletta. Simyan and Mokkari, genetic scientists from Apokolips who operated a sinister and parallel DNA Project on Earth. From Superman's Pal, Jimmy Olsen #135 (1970); art by Jack Kirby and Vince Colletta. The original Newsboy Legion and their sons. From Superman's Pal, Jimmy Olsen #135 (1970); art by Jack Kirby and Vince Colletta. The Project clones a new Guardian ("Golden" in his first appearance). From Superman's Pal, Jimmy Olsen #135 (1970); art by Jack Kirby and Vince Colletta. Count Dragorin and his grim crew from Transilvane. From Superman's Pal, Jimmy Olsen #143 (1971); art by Jack Kirby and Vince Colletta. The Project's number one DNAlien, Dubbilex. From Superman's Pal, Jimmy Olsen #146 (1972); art by Jack Kirby and Vince Colletta. The inhabitants of the Wild Area were not New Gods. They were genetically engineered by scientists from the super-secret, underground government research facility called the DNA Project. It was run by the members of the original Newsboy Legion, who were the fathers of Jimmy's friends. The adult Gabby was now a teacher; Big Words a geneticist; Scrapper a social worker; and Tommy a medical doctor. The Project had mastered the human genetic code, could produce people from cells, and manipulate and control them. Elsewhere, Darkseid mirrored their efforts with stolen DNA technology. His project was headed by Simyan and Mokkari, who created a menagerie of monsters. They set one loose on the DNA Project and the senior Newsboys countered with their own warrior, their old friend Jim Harper aka the "golden" Guardian. Harper had recently died in battle and was cloned back to life. (#135) Note: The new Guardian was called Golden Guardian but in successive stories, the "Golden" was dropped. In early issues of Jimmy Olsen used only the name "the Project." Its name was tweaked later and cemented by a backup feature in Jimmy Olsen #142 (Oct. 1971) called "Stories of the D.N.A. Project." The DNA Project was revived and featured extensively in post-Crisis continuity, when it was renamed "the Cadmus Project" by Roger Stern and Ron Frenz in Superman v.2 Annual #2 (1988). Jimmy and the Newsboys uncovered the location of Darkseid's project while investigating the appearance of a lake monster in Loch Trevor, Scotland. Edge sent him there hoping it would be his end. Back in Metropolis, Superman and the Guardian fought another one of Darkseid's gangs, the San Diego Five String Mob. (#144) Locals in Scotland sighted mythical creatures such as the griffin, chimera, unicorn, basilisk, and a red monster with large glowing eyes called Angry Charlie. Jimmy and his friends befriended the monsters and followed them back to the evil factory called Brigadoom. Under the lake they found of Mokkari and Simyan who activated Jimmy's genetic potential and turned him into a mad brute. (#145) Jimmy's rampage freed all the creatures and set off an explosion that destroyed the facility. (#146) Angry Charlie was the only survivor of the Evil Factory and he returned with the Newsboys (with tablets to sedate him). In the final letter column, it was explained that Jack Kirby had "extended himself a bit too far" and had fallen behind in his schedule, so he was "turning the mag over" to Joe Orlando with the next issue. Orlando took Jimmy Olsen in a new direction, although he did pen a story to tie off one of Kirby's plot threads. In issue #152 (Aug./Sept. 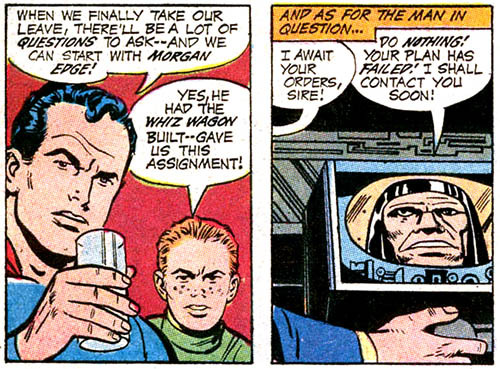 1972), Yango returned with the real Morgan Edge, who had been cloned and replaced by Darkseid. Before Superman could confront the fake Edge, Darkseid stepped in and set him up to be killed by a member of Inter-Gang. Darkseid and Highfather exchange their sons, Orion and Scott Free, for peace. From "The Pact," New Gods #7 (1972); art by Jack Kirby and Mike Royer. New Genesis and Apokolips. From The New Gods #2 (1971); art by Jack Kirby and Vince Colletta. Metron witnesses the "Final Barrier," or Source Wall, where the Promethean Giants are imprisoned. From The New Gods #5 (1971); art by Kirby and Royer. Lightray and Orion in their battle against the Deep Six. From The New Gods #6 (1971); art by Kirby and Royer. A lowly "bug," the Forager, comes to Earth to aid Orion. From The New Gods #10 (1972); art by Kirby and Royer. Desaad bears the brunt of Darkseid's terrible Omega Effect. From New Gods #11 (1972); art by Kirby and Royer. When the New God Seagrin — who dwelled below Earth's oceans — was killed by one of the Deep Six, his death reverberated across New Genesis. (#4) Orion retaliated by killing the Six's leader, Slig. Sgt. Dan "Terrible" Turpin was the point man in the war against Darkseid's Inter-Gang. Turpin worked closely with Orion's ally, detective Dave Lincoln. Metron's search for ultimate knowledge led him to the Source Wall (originally called the "Final Barrier"), where ancient Promethean Giants were imprisoned after trying to breach it. (#5) Note: In post-Crisis times, Karl Kesel made Turpin into the grown-up version of the character Brooklyn. (Guardians of Metropolis #3, Jan. 1995). Brooklyn was a member of the Boy Commandos, who were also co-created by Jack Kirby way back in Detective Comics #64 (June 1942). Pinups from The Forever People #4 (1971); art by Jack Kirby and Joe Sinnott. The end of the series featured an odd team-up with Deadman, a character who was not appearing in a regular series at the time (he first appeared in Strange Adventures #205, Oct. 1967). The Forever People provided the immaterial hero with a "follower" so that he could take physical form. (#9–10) The events of that story contradicted some of Deadman's previous appearances and were ignored in later Deadman stories. Like The New Gods, The Forever People ended in 1972 with issue #11. In the final issue, Darkseid dispatched Devilance the Pursuer to capture the Forever People. They finally managed to summon the Infinity Man again, and traded places with him. The Infinity Man was destroyed in combat with Devilance, which left the five New Gods and their Mother Box stranded in an idyllic other-dimensional world called Adon, apparently forever. Funky Flashman and Houseroy (aka Stan Lee and Roy Thomas). From Mister Miracle v.1 #6 (1972); art by Kirby and Royer. 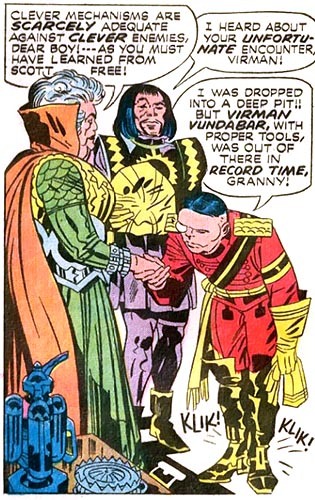 Mister Miracle's rogues gallery: Granny Goodness, Kanto, and Virman Vundabar. 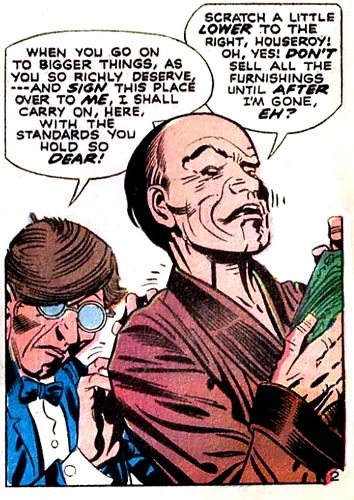 From Mister Miracle v.1 #8 (1972); art by Kirby and Royer. Shilo Norman adopts his own costume. 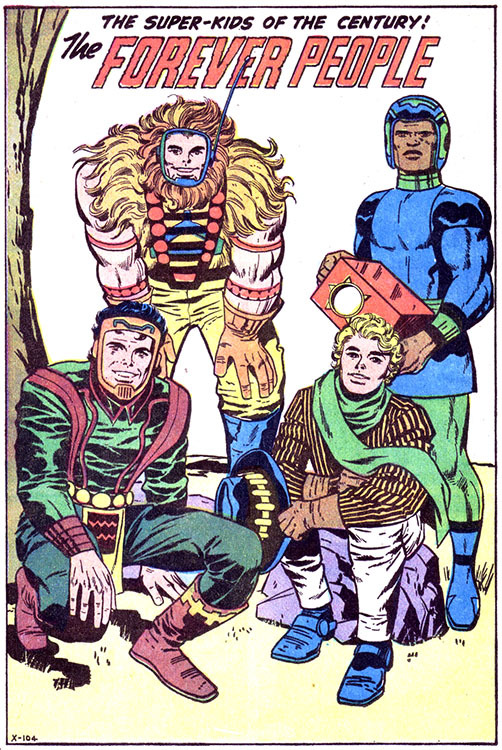 From Mister Miracle v.1 #17 (1973); art by Kirby and Royer. Batman out-escapes Mister Miracle. From The Brave and the Bold #128 (1976); art by Jim Aparo. 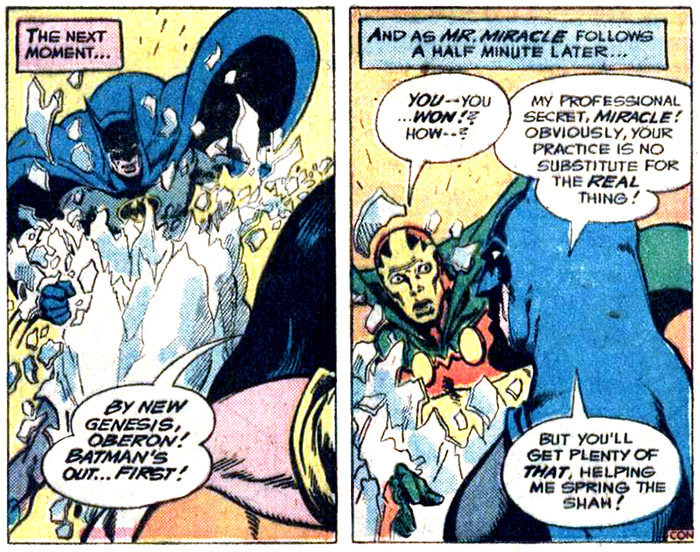 Mister Miracle survived the cancellation of the other two titles and continued into 1974. This series was probably regarded as more reader friendly and the title character was the most "super-hero-like" of the New Gods. Mister Miracle #9 detailed the events that led to Scott Free's escape from from Apokolips to Earth. The letter column in Mister Miracle #15 briefly addressed the cancellations, promising that the adventures of the New Gods would continue. Despite the promise, the other New Gods didn't make an appearance in Mister Miracle until its final issue (#18). Again the editor weighed in, reassuring fans that the cancellations weren't because of mysterious reasons, but sales. Mister Miracle's future wife, Big Barda, first appeared in Mister Miracle #4 and went on to steal most of the scenes in which she was featured. This was probably due in part to her appearance in bathtubs and bikinis; she was rarely in her battle gear. Even Barda's warriors, the Female Furies (#6) sported exotic swim wear. The Furies dotted the epic landscape in addition to colorful villains under the command of Granny Goodness. (#2) Granny relentlessly dispatched the likes of Doctor Bedlam (#3), Virman Vundabar (#5), and Kanto (#7) to arrest her erstwhile pupils. The series seemed to switch gears a bit after issue #8, when Scott won his freedom from Apokolips in a challenge. Mister Miracle's opponents were freaks from Earth, and Kirby even introduced a good old-fashioned sidekick, young Shilo Norman. Norman was trained by Scott and Barda and he also adopted a uniform that was somewhat reminiscent of the Golden Age Sandman's partner, Sandy. A few months after the cancellation, Mister Miracle appeared in The Brave and the Bold #12, teaming up with Batman in Egypt. (Brave & Bold #112) The next time they met, Scott told Batman that he and Barda had been married but that he missed the excitement of performing on Earth. They cleaned up an operation by Granny Goodness. (#128) The last team-up was published during the 1977 revival of Mister Miracle, but an editorial note placed the story before the revival. Mister Miracle and Batman faced Cosimo, Europe's foremost escape artist. (#138) All of these stories were by Bob Haney and Jim Aparo.